Heavy polling took place in last week’s competition of the Observer-Mobitel Most Popular Schoolboy Cricketer of the Year contest as the voting is expected to end shortly. Even in the Observer-Mobitel Most Popular Schoolgirl Cricketer of the Year contest, a staggering number of votes were the order of the day. The leading contestants in both the competitions were faced stiff competition as two new leaders were emerged. Sri Lanka cricketer Naweed Nawaz, who won the Observer Schoolboy Cricketer of the Year mega title in 1993, was the first and only cricketer from D.S. Senanayake College to achieve that honour. During his illustrious career at D.S. 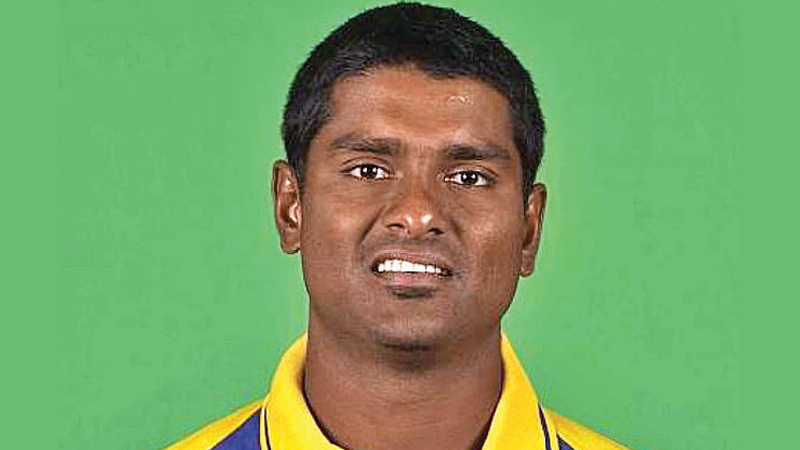 Senanayake College, Nawaz was a household name with some aggressive batting and a number of big scores. Even after his exemplary school career, Nawaz scored consistently for his club side, Nondescript Cricket Club (NCC) for a number of years,with an attractive average. Despite maintaining a stunning average of 99.00 in the only Test he played in, his international opportunities were limited. He made his Test debut against Bangladesh on July 28, 2002 but was unfortunate to be demoted to Sri Lanka ‘A’ team after scoring 21 and 78 not out in his respective Test innings on debut. Until his surprise recall for the Nat West series in England in 2002, he had made just a solitary one-day appearance - against Zimbabwe in 1997-98. However, he failed to impress at No. 3 position on that occasion, scratching around for a 23-ball five runs. In March 2004, Nawaz led Sri Lanka ‘A’ in its unofficial Test tour of New Zealand. His strong team included five fast bowlers, an all-rounder and a solitary spinner on the five-week tour, in which Sri Lanka ‘A’ played a series of three five-day unofficial Tests, and three one-day matches against New Zealand ‘A’. The Lankan team included Lasith Malinga. Nawaz later played the role of Consultant Coach for the Sri Lanka women’s team and in May 2009, he was named Sri Lanka Under-19 coach. Sri Lanka’s first ever award show for schoolboy cricketers, which has produced many champion Sri Lanka cricketers, is back in the true spirit of the game to continue its role in fostering school cricket. It is with pride and honour that we plan to conduct the 41st Observer-Mobitel Schoolboy Cricketer of the Year 2019 event. The proud principal sponsor of the Mega Show is Sri Lanka Telecom Mobitel, Sri Lanka’s national mobile communication network. This is the 11th successive year that SLT Mobitel is sponsoring the show, at a time the company is heading towards new horizons under the dynamic leadership of SLT and Mobitel Chairman Kumarasinghe Sirisena and the SLT Mobitel CEO Nalin Perera. It is heartening to see that more and more school cricket award shows are emerging, following that great initiative of Sri Lanka’s flagship English newspaper – the Sunday Observer way back in 1978/79. Lake House inaugurated the Observer Schoolboy Cricketer of the Year contest at a time when there wasn’t a single awards ceremony to recognize the talents of schoolboy cricketers. Neither the school cricket governing body (Sri Lanka Schools Cricket Association) nor the national governing body for cricket (Sri Lanka Cricket or then BCCSL), had a program to reward outstanding schoolboy cricketers then. There were no inter-school tournaments for first X1 cricket either. But 41 years ago, the Sunday Observer, as the country’s undisputed English newspaper since 1928, realized the need to recognize talents of budding schoolboy cricketers who could step into Sri Lanka national teams and become international stars by organizing this show of shows. Our initiative has proved fruitful as the Observer Schoolboy Cricketer show winners have gone to hit the top as international cricketers. It was the then Royal College captain Ranjan Madugalle who was adjudged Observer Schoolboy Cricketer in 1978 and 1979. That inspired Madugalle to go places, captaining NCC in club cricket, leading Sri Lanka with distinction and currently holding the top post in international cricket as the Chief ICC Match Referee. Sri Lanka’s 1996 World Cup winning captain Arjuna Ranatunga had the honour of winning the Observer Schoolboy Cricketer of the Year title twice – in 1980 and 1982. Over the past four decades, the Observer Schoolboy Cricketer of the Year contest has gone from strength to strength, producing some of the best Sri Lanka cricketers – Asanka Gurusinha, Roshan Mahanama, Muttiah Muralitharan, Kumara Dharmasena, Marvan Atapattu, Sanath Jayasuriya, Thilan Samaraweera, Dinesh Chandimal, Niroshan Dickwella and Kusal Mendis, to name a few. All of them have entered the big league after their ‘graduation’ as Observer-Mobitel Schoolboy Cricketers. The success and immense popularity of the Observer-Mobitel Schoolboy Cricketer of the Year contest has persuaded some to follow our great initiative and conduct schoolboy cricketer awards shows but none of them would ever be able to emulate the Observer-Mobitel Schoolboy Cricketer of the Year contest which continues to maintain its rich traditions. On the other hand, we are delighted and honoured to see more school cricket award shows emerging because that eventually meets our initial goal. We are happy to see others following the Sunday Observer example because it helps its country’s budding schoolboy cricketers who would ultimately benefit from all these shows. Hence, the Mother of all Shows – the Observer-Mobitel Schoolboy Cricketer of the Year contest continues for the 41st time, breaking new ground and serves as a talent search for tomorrow’s cricketing heroes. Although the 2018-19 season is coming to a successful conclusion, you could still vote for your favourite cricketer from any school in the Observer-Mobitel Most Popular Schoolboy Cricketer of the Year contest as well as for your favourite Schoolgirl Cricketer. Voting coupons are published in the Sunday Observer, Daily News, Dinamina.